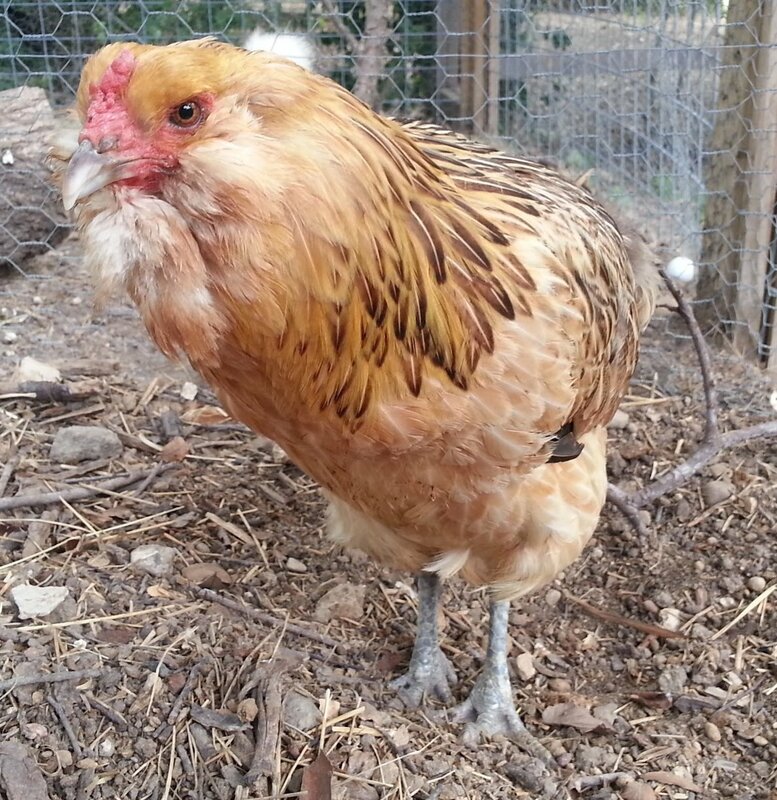 this sweet little chicken was in our lives but briefly. back in early june, she (mighta been a he) was acquired as a new flock friend after the untimely demise of dear twitter. everything was going great (for like 2 days) until she met the SECOND snake to plague our coop this summer. turned out that snake had a taste for more than just eggs, and so she was murdered. in a fit of hammurabian rage, the murderous snake was also murdered. it was not the most shining of TUF moments. but, live and learn and live. she wasn't even around long enough to get a permanent name, so she will live forever in my memory as "Lil Bitz." earlier this summer, we took another trip to Port Aransas like we did last summer, and stayed at the same place, although it's now called Amelia's Landing. this time we brought both dogs, and they were salty beach dogs for the first time! great fun was had by all, and though there was a plethora of beautifully scary and goopy man o' wars (men o' war? ), no one got stung. yay for the beach! i have no pictures of this at the moment, but we attended my beautiful sister's wedding shower in dallas july 14th. she's getting married on september 2nd, and i'm the MaidTron v.2012 of honor. ("matron" sounds too...well, matronly. and old and fat. and i'm trying to avoid those kinds of connotations.) i also partied (gently) at her bachelorette shindig on july 28th. i am so excited for my darling closest relative's celebrations! and i'm so honored to be her MaidTron. then of course came the Big Fancy Trip we had been planning for some time, to South Korea. thank goodness for the family and friends who looked after our zoo while we were gone. a dear friend from school took all the rodents and reptiles into her BRAND NEW HOME for the 10 days, a responsible kid from the neighborhood was on am and pm chicken duty, another dear friend from the neighborhood and my beloved uncle came to check on the cat and house, and the dogs got to go to camp at the Canine Hilton down the street. what with all the animal accomodations, we needed to make this one count. AND WE DID! it really was an amazing journey. and so, two more weeks of summer vacation! what else might happen? 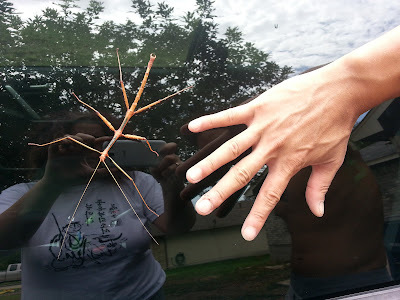 how about this enormous stick bug that dan came in to tell me about AS I WAS TYPING THIS VERY POST? 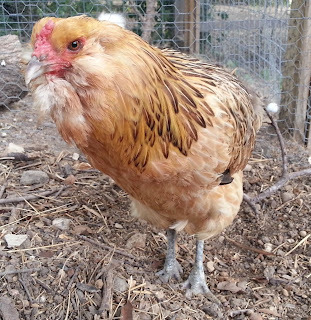 here is sammo, the free-rangiest of all our chickens. she is a beautiful easter-egger, laying lovely light-green eggs nearly every day. she has a delightful beard. 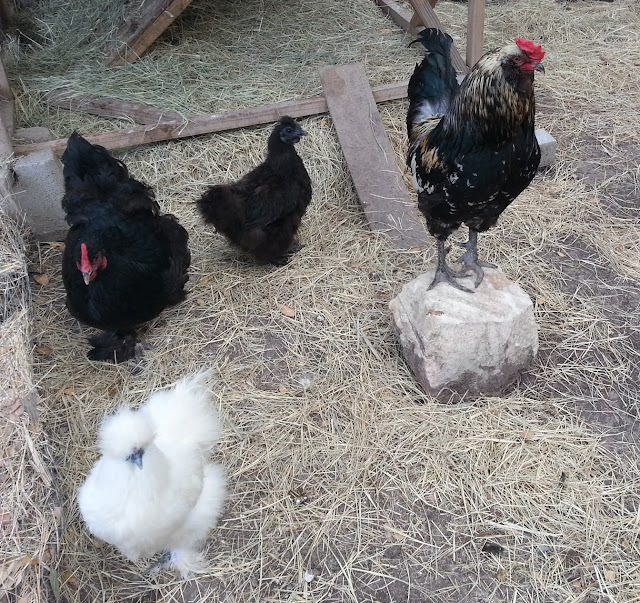 she generally seems to be in charge of the flock, holding sway even over tumblr, the incorrigible rooster. i say she's the free-rangiest--she is the most capable of flying, and has generally been able to go where she wants, even if the rest of the flock is in the run. captivity isn't for her, and she enjoys moseying about the neighbor's yard, exploring the immediate behind-the-fence area, and checking out points inaccessible to less savvy, ground-bound chickens. 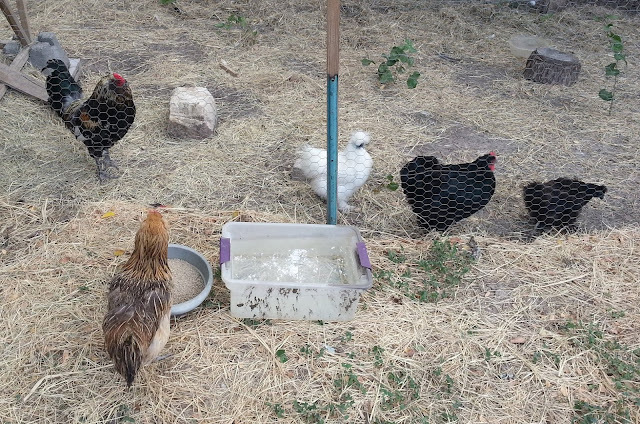 when we let the rest of the flock wander around the yard, she will come back from her ranging to hang out with them--but if they're in the run, she'd prefer to be on her own, thank you. i knew her ranging posed an inherent risk, but for months she hadn't run into any problems, and seemed well-equipped to handle herself in any number of chickenrisky situations. 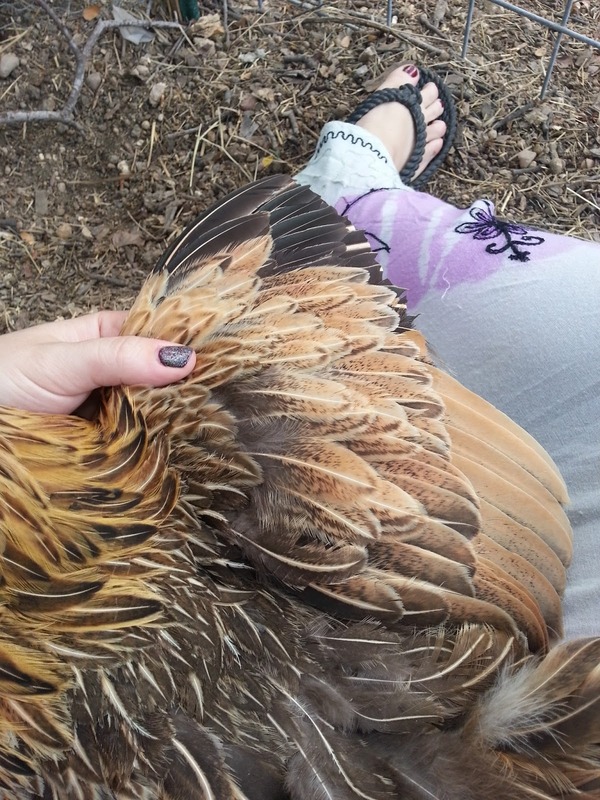 when she came to us last summer, her wings were clipped, probably to discourage her wandering tendencies and keep her safe, but i just couldn't quite bring myself to re-clip once the flight feathers grew back....she seemed like such a self-actualized chicken! HOWEVER. the other day she ran into some trouble. it looked like a cat, perhaps--i think the nearby potential dog perps would have done more damage, but who knows. at any rate, on friday she didn't come flopping into the yard when i let the other birds out, and i saw her standing forlornly on the neighbor's bird bath, tail drooping, eyes nearly closed. i had to pick her up and bring her back over. 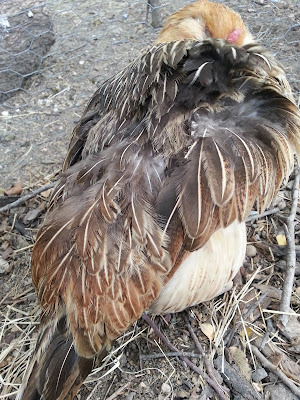 there was no blood that i could see, nor any broken bones, but it seemed that her legs just didn't quite work, and i could see broken and torn feathers on her wings and back. 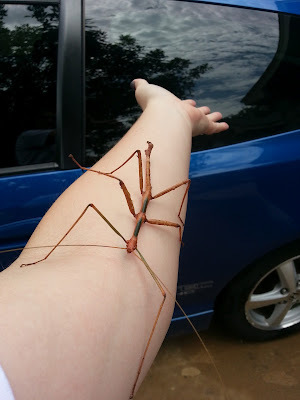 (below right is how she looked today, way better, but you can still see some broken feather stumps!) i figured she'd had some trauma, and hoped dearly that a couple days rest and extra attention would get her walking again. 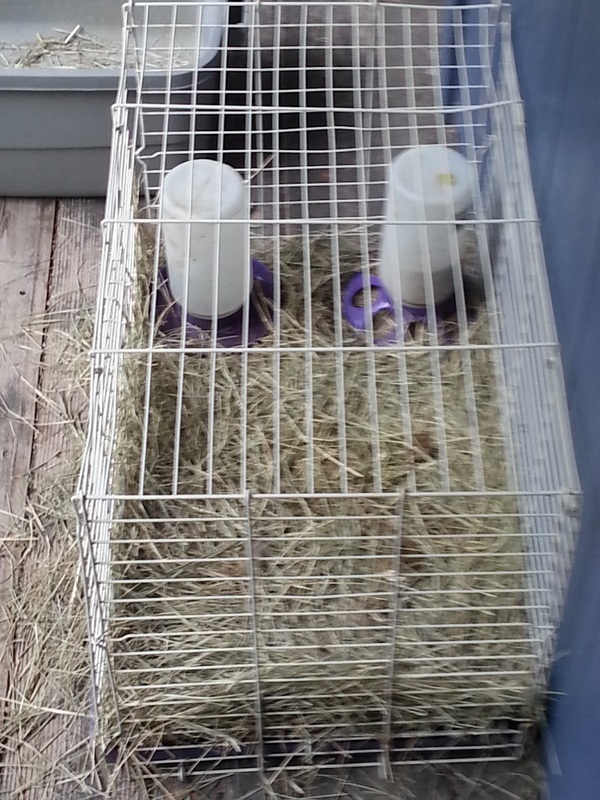 so, much to her annoyance, she took up temporary residence on the back porch in our chick-cage-turned-hospital room. 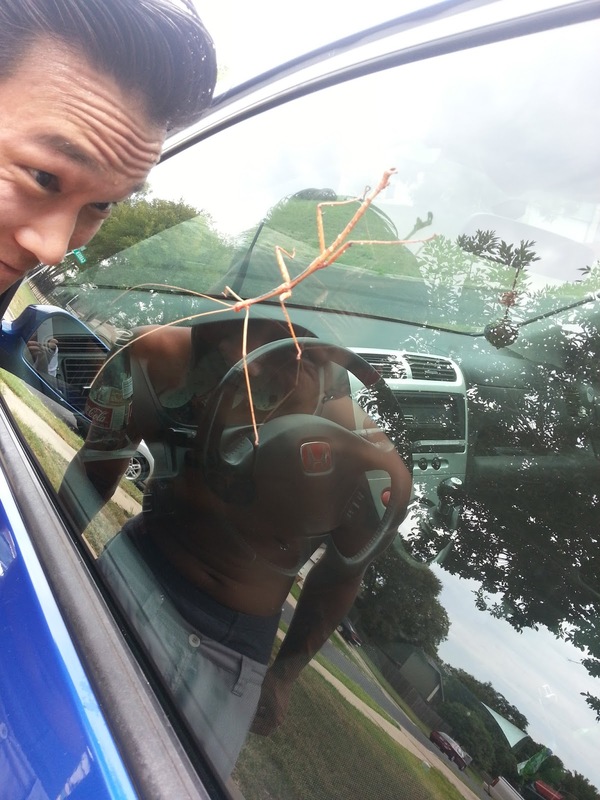 poor sammo! she hates being cooped up in any form, so this was really the ultimate bummer for her. i felt terrible--i was trying to let her be this free-rangy self-actualized chicken, but that which i hoped wouldn't happen turned out to be the inevitable after all. lesson learned--chicken injured, but not dead, and i had hope that she was fighter enough to get her leg use back! she got some excellent foot, leg and back massages, and got to eat some tasty strawberries, yogurt, cheese and mangos. she dutifully sat and rested, and soon seemed more able to get on her feet. 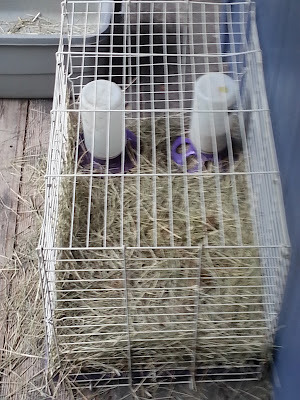 today marked 3 days since her injury and admission to the back porch hospital, and she was able to stand without wobbling and walk about a bit. i thought i would try putting her in the yard, separate from the other ladies and gentleman, to get some exercise and practice walking again. i knew she wanted to be back with her flock friends, but i also didn't want mr. tumblr to take advantage of her weakened state. 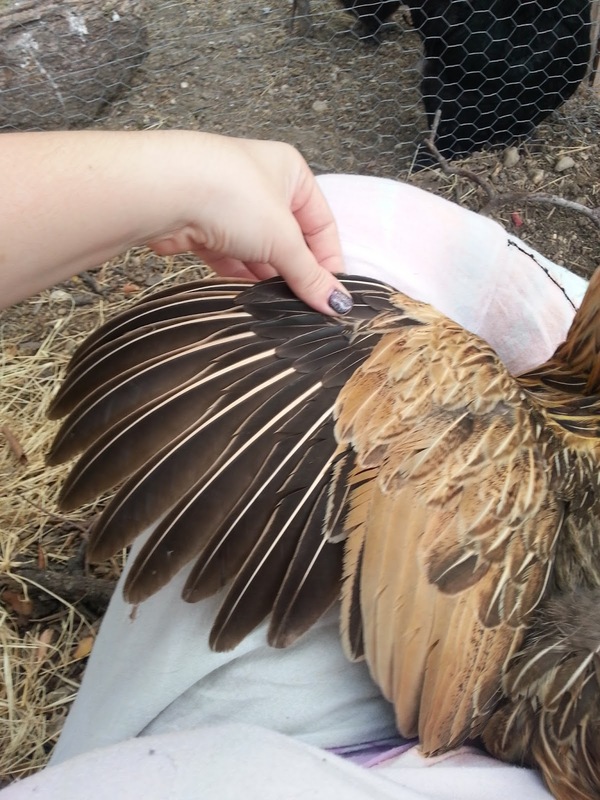 i also decided, with some sadness, that i would clip the flight feathers on one of her wings. i knew that as soon as she was walking she would try flying again, and i would like to avoid any further injury. since i had no previous experience with wing clipping, i visited the indispensible Back Yard Chicken Site's How-To on clipping chicken wings. i only clipped the right wing (political implications notwithstanding) to throw off the balance needed for flight. i hope she forgives me. Graphic courtesy of "A Guide to Raising Chickens" by Gail Damerow and BYC. I love when things look just like the diagram! (from bottom left) pearl, bolo, ninja and tumblr are confused without sammo bossing everyone around! everyone will be back to normal soon!